Original drawing (from around 2008) for the Fudebakudo cartoon about war elephants. 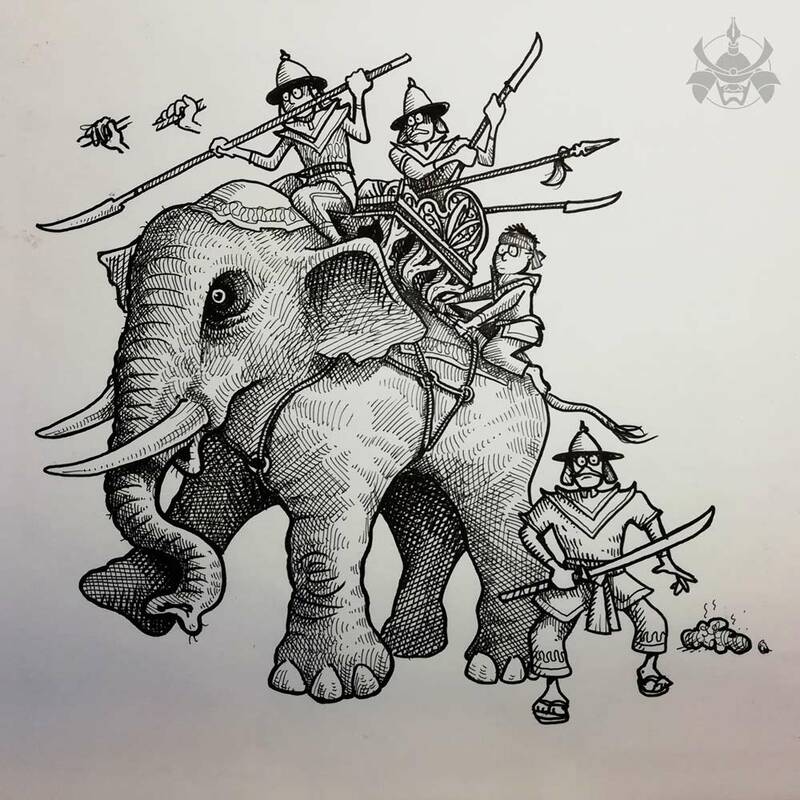 This piece was specifically about Thai war elephants having one bodyguard per leg (“So, you’re a bodyguard, eh?” “No, just a legguard"). Also, contrary to a surprisingly argumentative opinion I recall having to endure from someone who hadn’t done the same research on this that I had, in battle the elephant’s driver basically sat on the hapless animal’s arse, in order to allow the combatants (in some cases royal) to be at the front — as illustrated here. This illustration shows a number of cartoonist stratagems which I am not too proud to point out: clearly I still can’t draw hands properly, hence the reworkings up there to allow the Best of Three to be slid into place digitally in the Final Artwork; the cheap and unfair trick of darkening the area around an antagonist’s (in this case, elephant’s) eye to make it seem more intense and aggressive (I feel bad about this because when I have stared into Thai elephants’ eyes, all I have ever really seen in there has been sorrow); and the irresistible hilarity of drawing poop with smell wiggles coming off it. This was drawn for inclusion in the UK’s Martial Arts Illustrated magazine (so isn’t in the book, which was published several years earlier).